Hi there! 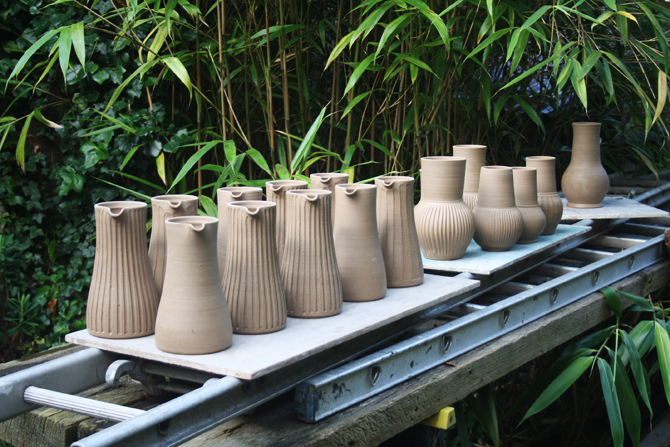 Its almost Christmas and production at The Marches Pottery has upped accordingly. Here at the workshop in Ludlow, we have a gallery/shop in front of the studio and everything we make gets sold through it. It's quite an unusual set-up for a pottery, with pieces very rarely going out to (mainly local) galleries and no outside stockist of the standard ware. The whole system works well though, with the shop being filled by roughly a kiln's load of work, and it taking around 2-3months for the shelves to start thinning, and for us to make another load. I am responsible for making the majority of the standard-ware now and am trying my hardest to increase my production pace. I am a careful thrower and often take longer than I'd like on repetition pieces. If I am to ever run my own studio, its important that I'm able to manage my time and work quickly and efficiently. Andrew is currently very pleased with the quality of my smaller pieces, but is concerned about my ability to throw larger bits of clay. He's encouraging me to throw flower pots and tall jugs as practice -I cut them in half at the end of the day to check my throwing, and only keep the best to turn and glaze. I did my usual thing of getting initially way too stuck-in, and ended up with some seriously aching arms! Throwing bigger lumps of clay (I'm talking 4-8lbs) requires different techniques to smaller pieces. 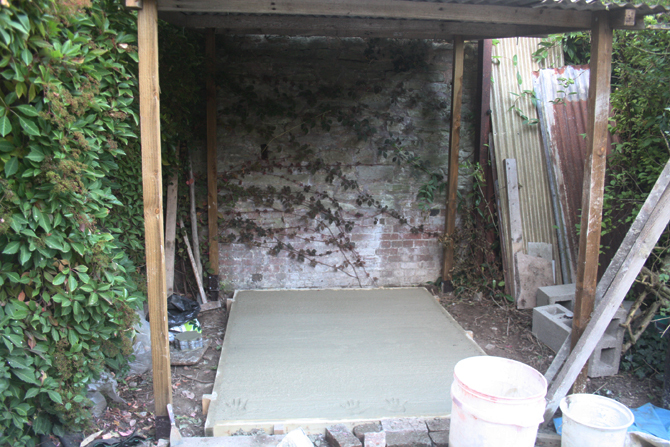 There a lot to learn in terms of using my bodyweight and different parts of my hands to centre and control the clay. It an exciting time though, and I really want to get there so that I can throw at a scale that will take me out of my current realm of small tableware. Below is a picture of some 3lb jugs. Towards the end of summer a friend of Andrew's started on building a small gas kiln in the yard. Its a Joe Finch designed gas-kiln that Andrew's had in pieces, waiting to be assembled for a couple of years now. 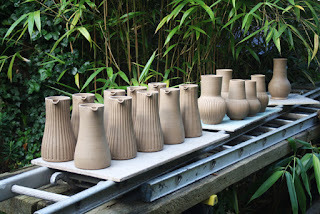 It been really interesting to build a kiln from scratch and has got me much more clued-up about the firing process. I've never fired with gas, so I'm looking forward to see what it produces too. Below is a picture of the very satisfyingly flat concrete floor we laid ready to start building on top. I took sometime in October to focus on developing my own work. I had been part of a small group show in Essex earlier in the month and had wanted to get some new work through the kiln but fell short of time after Andrew sadly put his back out. It was still a great impetus to think about my own style and what I want to make for myself. I have been looking at West and Central African art and ceramics a lot recently and I believe its coming through in the work I'm making. Its a really great feeling to have reached a point in my skill that I can begin to successful express something of myself. 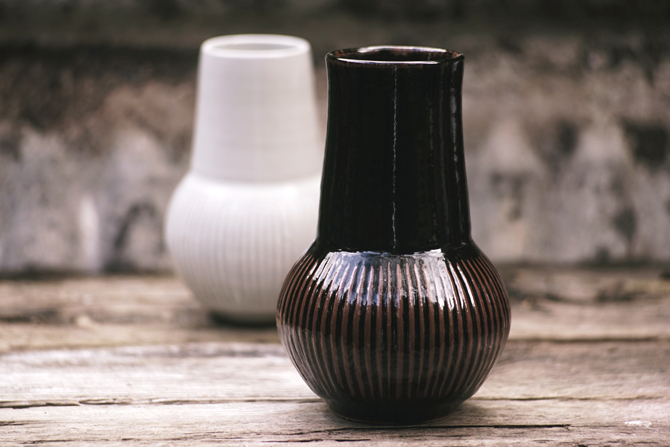 Below is a picture of some vases that I'm particularly proud of that demonstrate the influences of more african forms that I will look to pursue in the future.